Mad Martins is the latest project from internationally acclaimed songwriter and performing and recording artist Gary Miller (“As a song poet there are few in the world today to match him”, Green Man Review, U.S.A.), in collaboration with renowned Tyneside poet Keith Armstrong (A fine poet… he is one of the best”, Adrian Mitchell), produced by award-winning producer Iain Petrie and featuring contributions from a range of notable guest musicians. Eldest brother, William was the self-styled “Philosophical Conquerer of all Nations”, a doggerel poet, pamphleteer, engraver and inventor. Like his younger brothers, he aspired to be ‘Renaissance Man’ and aimed for the “defeat of learned humbugs”. Jonathan Martin has gone down in history as "the notorious incendiary" of York Minster. Frequent fits of rage against the clergy, including an attempt to assassinate the Bishop of Oxford led to his committal to several lunatic asylums, from which he escaped twice, before setting fire to York Minster in 1829, for which he was again committed to Bedlam, where he later died. John, the youngest, was, like his brother William, an ‘all-rounder’, devising sewage schemes for London, along with a number of other inventions but is most famous for his epic New Romantic paintings of Biblical scenes. One of these, 'Pandemonium', based on Milton’s 'End of the World', sold in 2003 for a record £1.65 million. Mad Martins is released on Whippet Records (cat. no. WPTCDB24) in early 2018, as a 50-track triple CD by Gary Miller with Keith Armstrong, Iain Petrie & Friends, presented as a lavishly packaged 104-page deluxe book beautifully designed by artist and illustrator Helen Temperley and containing lyrics to all the songs, poems and spoken word pieces, with additional inter-linking text and many beautiful images, including paintings, engravings, sketches, illustrations and original artwork, further enhancing the story. 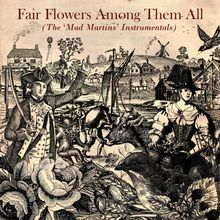 A companion piece CD ‘Fair Flowers Among Them All (The ‘Mad Martins’ Instrumentals)’ (WPTCD25) is also available. 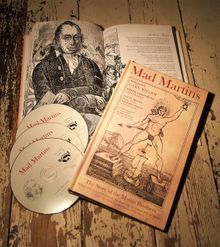 A Mad Martins stage show in 3 acts is currently being planned which will feature specially-made period costumes, props, and set design, accompanied by a pit orchestra of specially selected musicians, amid a projected backdrop of stunning visual images, all of which will contribute towards bringing the whole story of the Martins to life. "Gaze in awe and wonder. What is this mysterious artefact? To call it a triple-CD concept album is to demean it. An archive of myth and legends of lost hard-times in ye North East? A History Channel biopic movie for the mind? The theatre of the inner and outer ear? 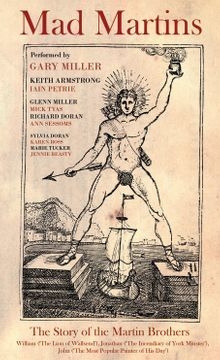 A coffee-table art book loaded to the seams with antique print curios, spoken-word verse of sinister and nefarious explouts, and engravings of exquisite quality? It's all these... and more. A veritable triumph!" ***** (Andrew Darlington, R N R, UK, Vol. 2, No.68, March/April 2018). "To say that this is a masterpiece is still an understatement." Rating: 10/10 (Kev Rowland, FRaME Music, UK, March 11, 2018). "Mad Martins is a magnificent piece of work, transcending both the traditional ideas of folk-rock as represented by The Whisky Priests and the established view of what a singer-songwriter should be." (Dai Jeffries, Folking.com, UK, March 16, 2018). "Part entertainment and part history lesson, the word ‘epic’ only comes close to describing the way the story is told in song, word and verse with some stunning artistry in the background from an array of musicians... this is a ‘musical story’ and is meant to be heard in one long session; and by jove it works... the whole story and the way Gary Miller (and friends) presents it has a feel of a Northumbrian 'Les Miserables' about it. I’m nearly lost for words now; I knew nothing of this story and feel obliged to read more deeply into it but more importantly this magnificently packaged Triple Disc box-set deserves a much wider audience than Gary Miller and Keith Armstrong’s loyal fan base; the story and the way they tell it deserves a much bigger and indeed national stage; all it needs is a generous benefactor." (Alan Harrison, Rocking Magpie, January 27, 2018). "A genuinely stimulating cultural artefact, born of an inspired collaboration of like-minded creative artists... an extraordinary work, an educational experience that both informs and (royally) entertains. It also happens to contain some great music and songwriting that bears both specific relevance to its subject and a definite resonance for our times." (David Kidman, FRUK, December 27, 2017). "The book presentation has been designed by Helen Temperley and is best described as a true 'labour of love'; a real work of art in its own right. The music, songs and spoken word echo the individual brother's contributions to an amazing Regency/Victorian saga retold here to reflect an aura of their era. 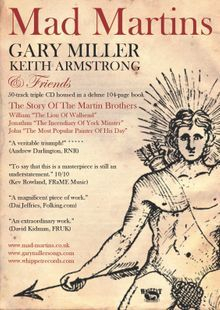 The album book in itself is a superbly detailed yet concise guide to the brothers and the illustrations, many by the Martins themselves, is the best presented, currently available introduction to the history stemming from Haydon Bridge's extraordinary sons." (Henry Swaddle, Hexham Courant, UK, December, 2017). "A triple entity which is both entertaining and fascinating. The combination of an array of musical genres... maintains a high level of interest throughout. It’s a rewarding and constantly enjoyable experience... Carve out some time. Set up a supply of your chosen beverage. Turn off your phone…and work through the CDs in order, entire, while losing yourself in the book. You’ll be transumed, lost in the visionary world of another place and time. And, trust me, it won’t be long before you’re longing to go there again." (Nigel Schofield, Tykes' News, UK, Summer 2018). "This is a highly ambitious piece of art that has been pulled off to perfection." (Mustard Finnegan, Shite 'n' Onions, USA, June, 2018). "I love a lavish curio and this is one such item... A beautifully realised package." (The Crack, UK, March, 2018). "Beautifully produced and presented, and with a stage show mooted for later this year, this is a major contribution to the North East music scene." (Jez Lowe, acclaimed singer-songwriter, Folk Column, The Northern Echo, UK, January 11, 2018). "Brilliant! Best thing from the region in a long time! A wonder-amazing! Everyone needs one - now!" (Conrad Jay Bladey, Hutman Productions, USA). "It is a thing of real beauty. Just brilliant!" (Joe Solo, acclaimed singer-songwriter, radio presenter The Joe Solo Radio Show at Coast & County Radio). "It's already clear that Gary can take his place among the great bards of the North East... not only huge in scope, it's ambitious and original too, covering art, history, music and madness with a large dollop of gothic vaudeville thrown in." (Paul Simmonds, acclaimed songwriter, The Men They Couldn't Hang). "Without any doubt this is the finest thing I have seen about (the Martin brothers). You have done your subjects full justice and a real service. You have produced a work of genius." (Paul McAuley, Martin Brothers afficionado).